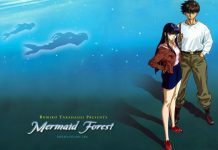 This anime is based on the Mermaid Forest story line found in the graphic novel by the same name. Mana and Yuta are drawn into the world of the Kannagi Family, owners of Mermaid Forest. Only two of the Kannagi clan remain – an old women and a young girl with hair as white as snow. What is the secret of these two women? And what is the secret of Mermaid Forest? Is there really a mermaid buried somewhere in the hills……a mermaid that could help Yuta return to normal?